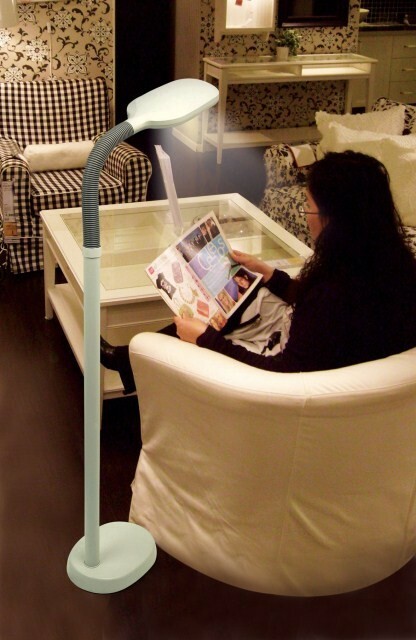 Reading Lamp For Users With Visually Impairment. Don't flail around in the dark if you're looking for lighting for the visually impaired. Look at the features of this daylight lighting solution. Of particular benefit to people with a visual impairment, this specially designed lamp uses daylight bulbs - allowing you to read, and concentrate for longer. It’s ideal for people with a visual impairment, this specially designed lamp uses daylight bulbs - allowing you to read, and concentrate for longer. Say so long to that headache causing eyestrain! The bright 27w daylight bulb supplied with the lamp provides a better spectrum of light than regular light bulbs, and are energy efficient as well. Tests have seen them last up to 8000 hours! This lamp for the visually impaired has a flexible arm to adjust the angle and make sure that the light shines where and how you want it.